These Sweet Babies are in stock and include shipping anywhere in the Lower 48 States at $249.95 Email me Directly at b.layton@svracingparts.com No PM Please. I receive Email instantly and do not check in often enough to make PM work. These are all excellent parts that will serve you well. Last futzed with by SV Racing Parts; June 10th, 2016 at 09:21 AM. Visit SV Racing Parts's homepage! Oooooh! Father's day is next weekend and it's way better than a tie! Free bump in case there are any left. 3 Pin Kits for the 2008 Up Ninja 250 - 300 models are left in stock until the next machining run is completed and received at my Washington State Warehouse. Hi Everyone. 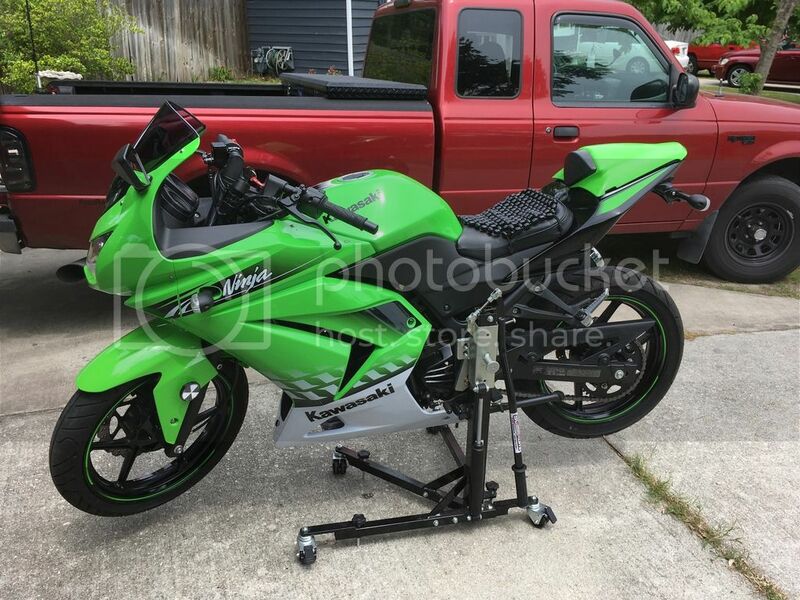 Act Fast; These are Awesome 2008 to 2017 Ninja 250R and Ninja 300 Black Custom Side Lift Stands; These are Excellent Parts that will serve you well!! 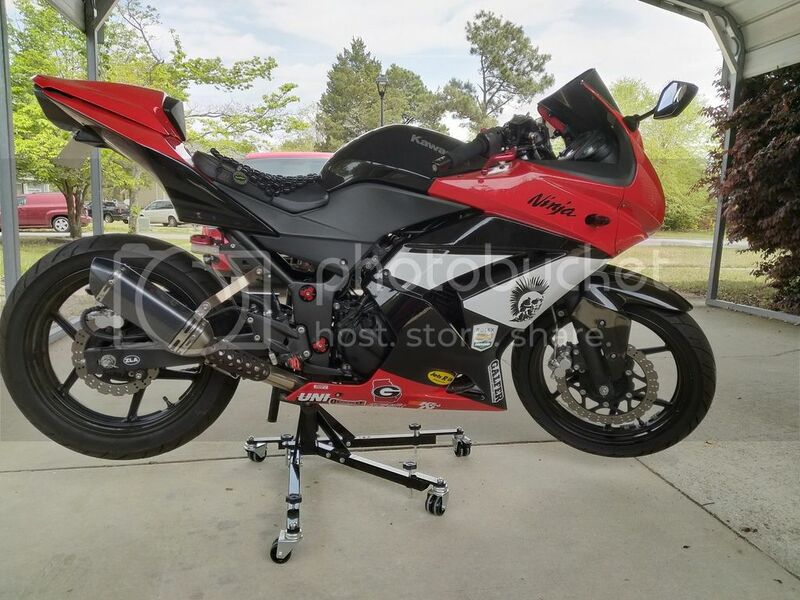 Best Ever Pin Kits for the 2008 to 2017 Ninja 250R and Ninja 300 models!! Stand is Improved and the Strongest Ever with Hydraulic Damper on the lift. In stock and ready to ship to you today from my Washington State Warehouse. i’ll do a write up when i get it. 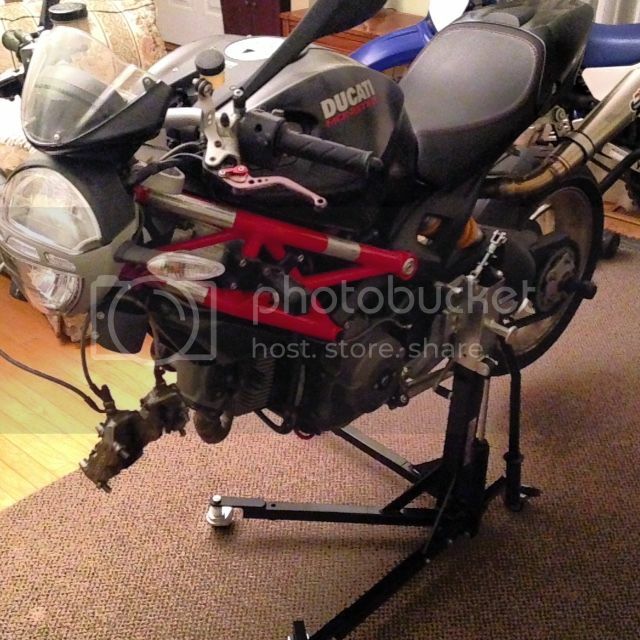 i have rear shock and chain/sprox change out coming up. looking forward to using a unique product. Maverick, I'm loving mine. Being able to spin the bike around in my shop so I can easily roll it out the door is wonderful. Be prepared to tweak the adjustments a fair bit before you get everything right. With two bikes I got it close enough on both and called it an evening. Eventually I'll get around to fine-tuning everything so it's closer to perfect. "Close enough" simply means you may need to wiggle things around a bit to get the pins into their sockets when you mate the stand with the bike. The stand itself is universal. It comes with a bike-specific mount that in my case consisted of a beefy machined plate that attaches to the lift with a big bolt, two pins that go into the bike's frame, a socket that mounts to the bike for one of the pins, and a threaded adjustment rod that sets and holds the plate angle. Since I have two different bikes, I was wondering if I'd have to readjust everything every time I swapped plates. 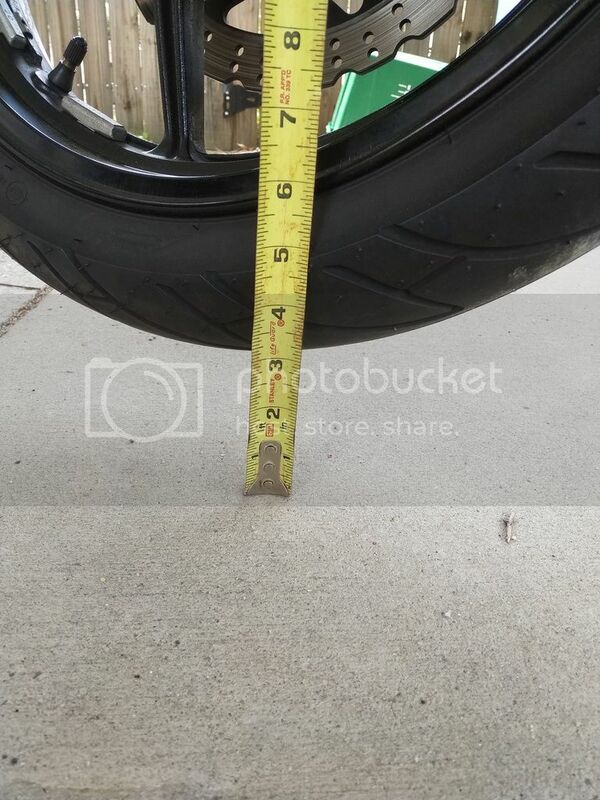 The good news is I don't... the angle rod adjustment is a one-time deal. Swapping plates consists of detaching one end of the rod and taking the big bolt out... can be done in a minute or two. What I did was to assemble the plate that holds the pins and mount it on the bike, then eyeball how it'd mate to the lift. I marked the positioning (big bolt placement and plate angle) with a sharpie. That got me in the ballpark and from there it was trial and error adjustment. The mounts are all different. 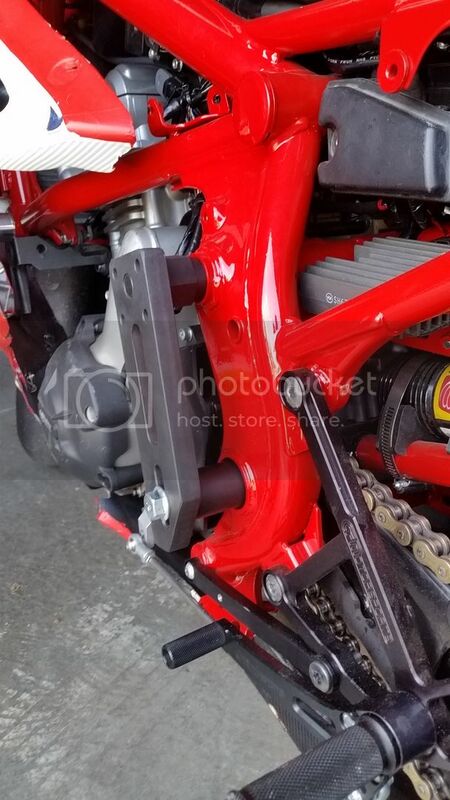 Depending on the bike you may need to loosen an engine mounting bolt, reverse it and replace the nut with the supplied machined/threaded sleeve. This was true for both of my bikes, but was trivial. Just get the torque right when you reassemble--that's a critical bolt. The stand comes with screw-in feet for, I suppose, extra security in addition to the locking casters. I've found them to be more trouble than they're worth, so I've just put them aside. The casters are high quality and the locks are solid. can ya send a pic? Might not be able to get to it for awhile. 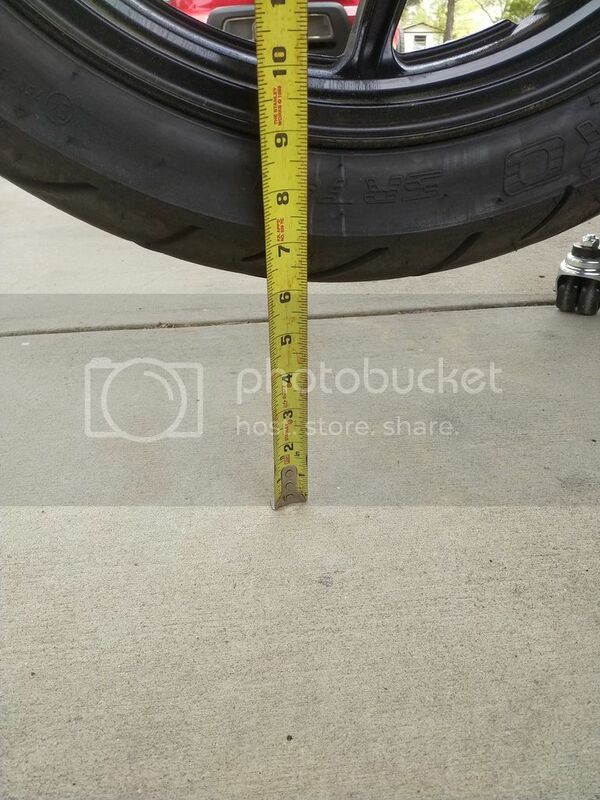 It's pretty self-explanatory if you're even mildly mechanically inclined. Just take the time to figure out how it works. starting to put together. I'm impressed with the craftsmanship. 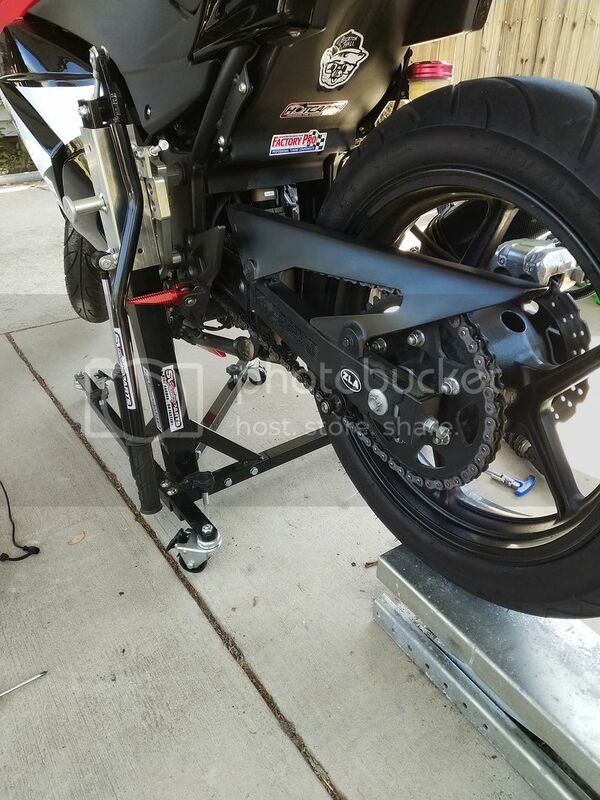 A few recent images of the Black Custom Side Lift Stand in Action. 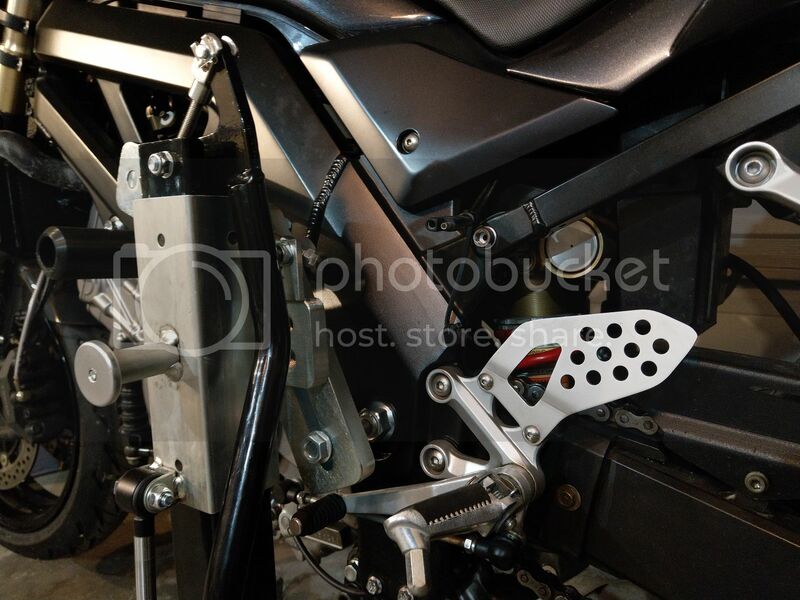 These Are Awesome Motorcycle Stands that will serve you well. If the stand is universal then why couldn't it work on a pregen? blairs stand has paid for itself countless times over. frankly, their is no comparison! 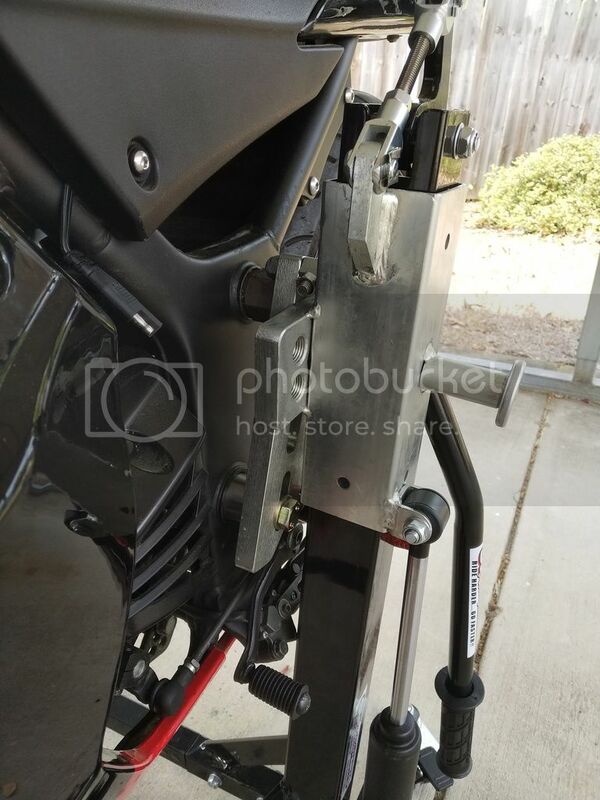 The Stands are Universal: You then utilize the year and Model Specific Pin Kit for the specific bike that the stand is being used with. It is the differences in the frames of bikes that the Pin Kits are individually designed to service. 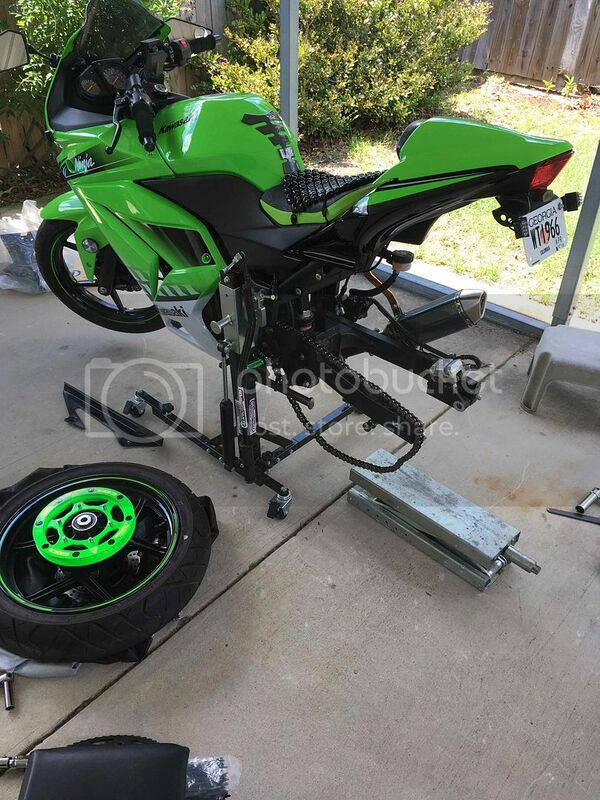 We have never attempted to fit the stand and Pin Kit to a 2007 and Older Ninja 250 due to lack of demand from older bike owners. 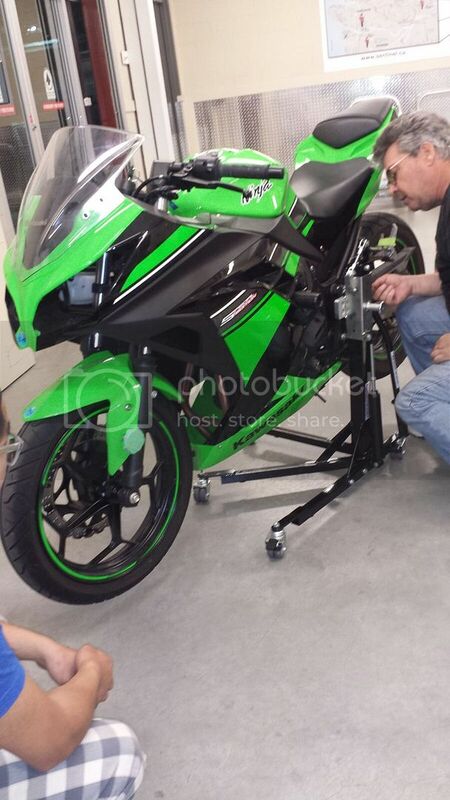 If you have the Fab and Mod Design Skills and access to some machining, it would not be difficult to develop a pin kit for your earlier model Ninja 250. Oh so its more of a R&D kinda thing. We've got an Abba stand that looks just about like that. 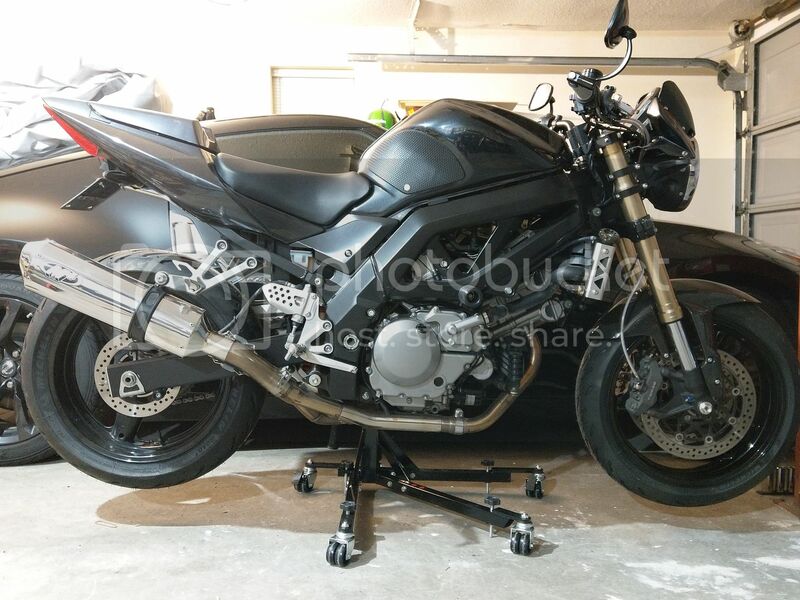 Was made for my hubby's Triumph, but we got a kit with spools to fit my pre-gen. Works great. [COLOR="Purple"]We've got an Abba stand that looks just about like that. 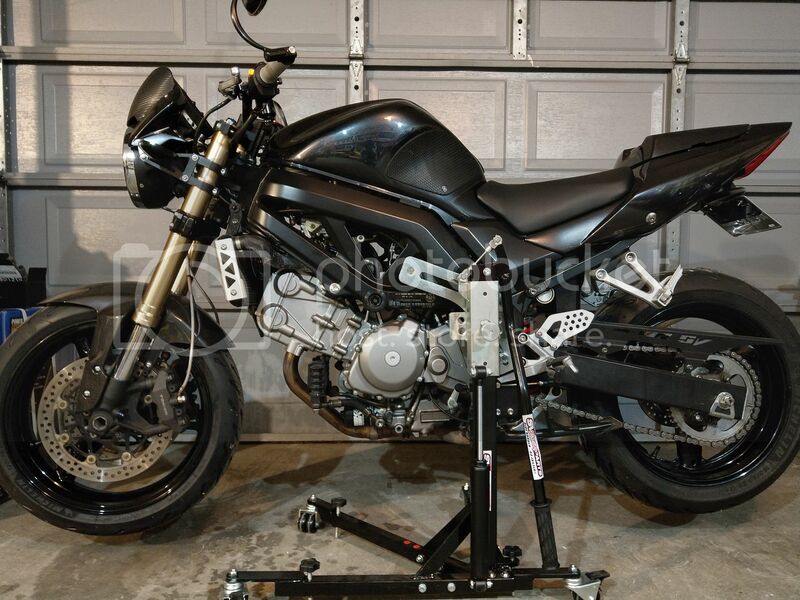 Was made for my hubby's Triumph, but we got a kit with spools to fit my pre-gen. Works great. Hey CaliGrrl, You should Email me directly at b.layton@svracingparts.com and we can talk about your pin kit. 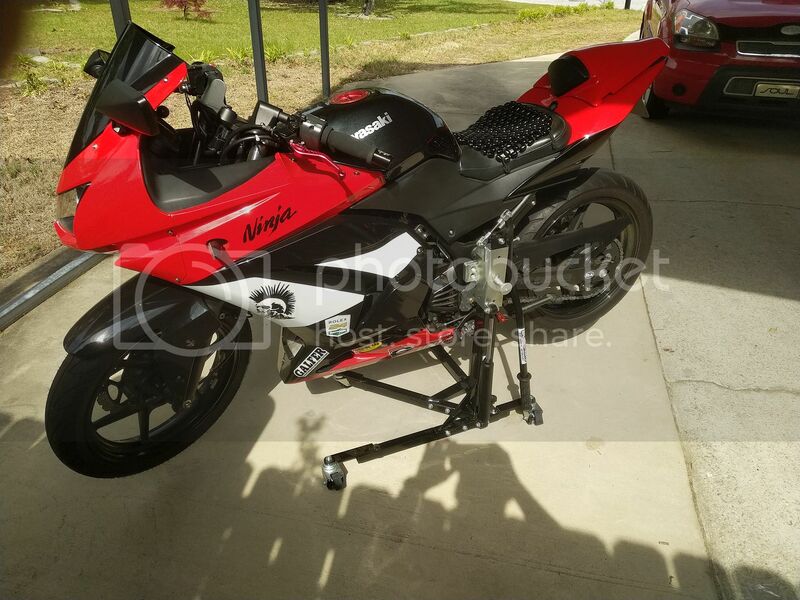 This may be chance to help out other members with the Older Style Ninja 250. Looking forward to hearing from you!! What are the dimensions of the stand when folded or disassembled for storage? They are casters and simply roll into a corner, Under 36"tall and 34" across. These are Excellent Parts that will serve you well.